^^Saint Augustine wasn't always a saint. He led a turbulent and licentious youth, and belonged to the fourth century equivalent of a street gang. At the age of 29, he met a young man, Ambrose, whose intelligence, kindness and strong faith fascinated and puzzled Augustine. Then at the age of thirty-two, under Ambrose's tutelage, Augustine converted to Christianity and went on to be one of the most influential Christians throughout history. ^^Written in 400 AD, less than a decade after his ordination to the priesthood, a mere four years after becoming bishop of Hippo, he wrote Confessions in his forties. He was a man looking back and looking forward, an apt simile perhaps for the role Augustine played in the history of the Church, that of a bridge between two distinct eras. ^^"It is difficult to find a theologian - from any age - who has not been influenced by the teachings of St. Augustine." Augustine's candor about his own sin and his struggle to reconcile his mind and soul to God's holiness has made this spiritual autobiography a revered classic for over fifteen centuries and compelling to today's readers looking for a genuine spirituality. Saint Augustine was born to a Catholic mother and a pagan father on November 13, 354, at Tagasta, near Algiers. He studied Latin literature and later taught rhetoric in Rome and Milan. He originally joined the Manicheans, a religious sect, but grew unhappy with some of their philosophies. He soon turned to Christianity and was baptized in 386. One of Augustine's major goals was a single, unified church. He was ordained a priest in 391 and appointed Bishop of Hippo, in Roman Africa, in 396, His writings and arguments with other sects include the Donatists and the Pelagians. On the Trinity, The City of God, and On Nature and Grace are some of his important writings. Confessions, which is considered his masterpiece, is an autobiographical work that recounts his restless youth and details the spiritual experiences that led him to Christianity. Many of Augustine's ideas, such as those concerning sin and predestination, became integral to the doctrines of the Church. Augustine died on August 28, 430AD. St. Augustine's Confessions have been a source of much theological and existential study since they were first published. Here we have a formerly adamant non-Christian turned one of the most influential Christians in history reflecting on his life, conversion, and sin. Through Augustine's reflections and memories he shares deep and penetrating insights on topics such as why we sin and why we reject God, alongside joyful praise of the God he formerly rejected. 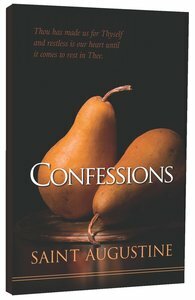 Through reading the Confessions one draws a deep sense of Augustine's character, rhetorical genius as well as his deep hunger for God, which drove his life. St. Augustine has served a great many Christians as a model for how sinful beings should live in a sinful world. This book gives the reader much food for thought and has the definite ability to change our lives for the better. A must read.